Zeal unlocks the power of nutrition from nature so you can be and feel your best, living a life filled with doing what matters the most to you. It's the simplest, most affordable, food-based nutritional solution you'll find that delivers clinically proven results at the highest level. Zeal is offered in a variety of flavors and formulas based on the location of the market. Our flavor line includes Wild Berry, Bold Grape, Tropic Dream, Kiwi Watermelon and Lemon Lime*. Some flavors are offered in a Gluten free, Vegan and Kosher formula. Zurvita's Zeal for Life® combines many of the most powerful nutritional components available today into a single, delicious, real-food product. Recognized as what's called a "functional food," Zeal transcends the role of many supplements, and provides the body with the food-based nutritional components it needs in a more fundamental form. The results? You can feel more vibrant and energetic, fueling a life of real purpose and significance. Zeal's balanced nutrition can be a foundational support to good health, proper energy levels and successful weight management. A convenient, great tasting, all-in-one formula focused on packing the most nutritional value into one serving. Provide your body with more energy from the food-based nutritional components combined in a single serving. Every ingredient matters, providing today’s most unique array of health benefits in a single nutritional product. All-in-One Formulas: Take the hassle out of healthy living. These unique formulas combine core vitamins, minerals and antioxidants with phytonutrients from fruits and vegetables, along with other exotic botanical ingredients from all over the world - all in just a single product! 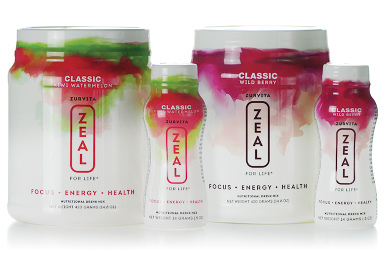 Classic Zeal represents the Original formula launched in 2011. The Vegan formula line, available in the United States, was added to meet current gluten free, vegan and Kosher certification standards and varies by flavor. Convenient: Consistency is key when it comes to nutrition. Our bodies need ongoing nourishment. The single-serving bottles make it easy for anyone to grab their daily dose on-the-run and never miss a day. Pop the top, add water and shake it up. It's the easiest way to consume this much nutritional goodness at one time. Great Taste: "Healthy" and "delicious" aren't two words you typically hear in the same sentence when it comes to nutrition, but people use these two words all the time to describe Zeal. Zeal’s great taste makes healthy living something you can look forward to every day. Clinically Proven: Feeling the Zeal difference means different things to different people and there definitely is a Zeal difference! Recently completed clinical trial results from independent third-party research firm, KGK Synergize†, confirm the positive benefits of Zeal including improved mood, stronger vigor and vitality, and less anxiety and fatigue. Under the highest scientific standards, the study was conducted on healthy and active people not trying to improve mood or enhance their current health. The American College of Nutrition Journal†† has published the KGK research on Zeal, providing further backing for its significant and positive difference in mood and health. Consult a physician before starting this or any supplementation. If you are pregnant or nursing, seek the advice of a healthcare professional before using this product. Not intended for children. *The Zeal Wellness flavors, formula, pricing and other factors vary by country. † KGK Synergize is a highly respected Canadian-based firm specializing in human research and clinical trials for the health, nutrition, biotechnology and pharmaceutical industries. †† The American College of Nutrition Journal is published eight times per year and accepts submissions pertaining to innovative research of nutritional importance with useful application for physicians and health care specialists. © Zurvita 2018. All rights reserved worldwide. "Lives are Changing®", "Daily Dose of Wellness®", "Higher Way of Life®", "Zeal for Life®", "Zurvita®" and all trademarks, product information, marketing assets and images on this site are the sole property of Zurvita, Inc. Unless otherwise specified, reproduction or commercial distribution, in whole or in part, is strictly prohibited without written permission.